You have two options. Using Windows Installer, or simply downloading the retroreloaded package and extracting it by itself on the microSD. 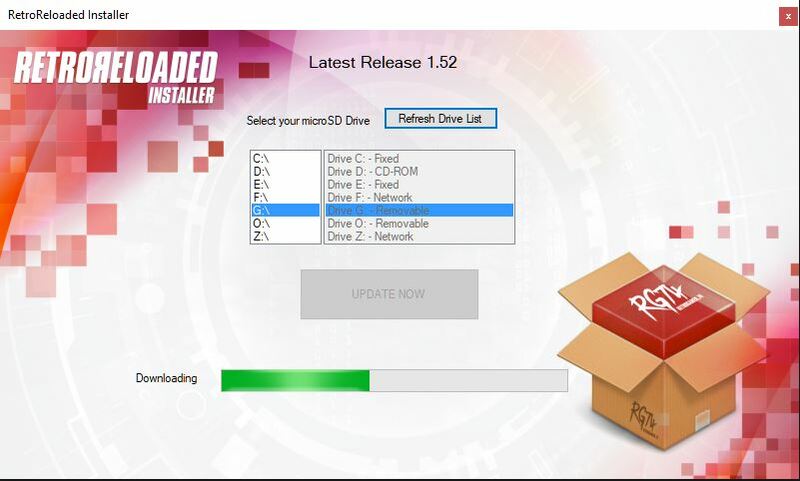 Just download the installer of Windows RetroReloaded to automatically prepare your microSD. Just download the latest version ( https://github.com/RetroGamer74/RR_RetroReloaded/releases ), extract it by overwriting the existing files in the microSD. Start using one of the next choices. You will find the payload.bin file in the root of the microSD files. This package provides that file. Copy that file to your desktop PC. Connect the dongle to the PC using the microUSB cable. Set it to Flash mode by pressing the button twice in the dongle. When you do, you will be able to browse the dongle folder. Drag and drop the new UF2 file downloaded from the link you used previously. When the flash has finished writing, the dongle folder will be closed automatically. You are ready to use. Use your mask, use the dongle. Enter RCM and you will see the menu. You are ready to choose your CFW. Depending on your wishes, you can start one of the three existing flavors. Support included to play Super Lan Play. You can play with your Switch, even if it is your console it has been banned, with other players, in multiplayer. Support included to play Super Lan Play. You can play with your Switch, even if it is forbidden, with other players, in multiplayer. Currently: it depends on the boot.dat file copied to the microSD boot. Remember to also copy the license.dat file. You can play in the Super Lan Play service, like the other CFW. The KIP patch was also included in SX OS. Removed hid_mitm: while this module is in beta, I removed it because it creates Atomphere crashes for users in 6.2.0 and creates problems navigating through menus in homebrew apps. Updated: Added hid-mitm. It supports GamePad like Xbox, PS4 and so on without using 8 bits. Extract the zip and run the app based on the platform you want to use. If you want to run on PC, run start.bat.